Why has Earth's core not become solid? The Earth is billions of years old, yet its core has not yet cooled down and become solid. Will this happen in the foreseeable future? I generally take "foreseeable future" to mean "in my lifetime" in which case the answer is No. However, if you are really asking, "What does science say about the solidification1 of earth's core?" then we can answer this. The "solid inner core" is pretty much pure iron at a nice pretty temperature of about 5700 K (strangely close to the sun's surface temperature), which seems to be greater than iron's melting point of about 1800 K, but the Clausius-Clapeyron relation shows that melting points change with an increase in pressure, so all is well there. ...the dynamical time-scale of the thermal convection in the inner core [is] $\sim$1 My or more. Which, though shorter than the age of the planet, is still pretty long. But the inner core is also growing at a rate of about 0.5 mm/year (possible paywall) and has been doing so for about a billion years. Though unreferenced, this Earth.StackExchange answer suggests that the core has cooled only 250 K since it was formed (a rate of 55 K/Gyr). At that rate, "...it would take something like 91 billion years to cool to 0 K." So no, not in our lifetime for sure! Note also that the mantle is being partially heated by radioactive decays of Uranium-238, Uranium-235, Thorium-232, and Potassium-40, all of which have half-lives of greater than 700 million years (up to about 14 billion years for Thorium). This will protect us for some time from the complete cooling of the core. So, fortunately for our tiny planet, the core will stay nice and toasty warm for a few more billion years (my estimation). Unfortunately for the planet, the sun will go red giant phase and eat it up before the core cools. Why has Earth's core not become solid? Will this happen in the foreseeable future? A lot of residual heat from the Earth's formation remains inside the Earth. Heat is released as iron and nickel freeze onto the solid inner core, which slows this freezing process down. The Earth is big. Moon and Mars are much smaller, and they still have liquid outer cores. Will this happen in the foreseeable future? The answer to the second question is no. It might happen in a few billion years, then again it might not happen at all. The Sun will turn into a red giant in about five billion years or so and might expand to engulf the Earth. If that happens, the Earth will be gone. The core answer to the first question is that a lot of residual heat from the Earth's formation still remains inside the Earth, and a good fraction of this residual heat is concentrated in the Earth's core. An argument against the Earth's core freezing any time soon (e.g., a billion years is "soon") is that the Moon (Williams 2006) and Mars (Yoder 2003) still have liquid outer cores. The Moon and Mars are much smaller than is the Earth. The square-cube law suggests that a large body such as the Earth will have an even slower core cooling rate than those much smaller bodies. Going against this, the Moon and Mars have stagnant lid convection systems while Earth has an active plate tectonics system. However, that our Moon still has a liquid core has to argue against the the Earth's core freezing any time soon. Latent heat of freezing as molten iron and nickel in the outer core freeze onto the inner core. Secular cooling of the Earth's inner and outer core. Gravitational heating as lighter elements in the outer core are rejected from the freezing process. Radiogenic heating from decay of radioactive elements in the Earth's core. The final item is highly controversial. Most geochemists and geophysicists are of the opinion that there are but negligible amounts of radioactive elements (235U, 238U, 232Th, 40K) in the Earth's core. Uranium, thorium, and potassium are strongly lithophilic elements. Moreover, they are incompatible elements. Compared to chondrites, these elements are concentrated in the Earth's crust, depleted in the upper mantle, and are likely slightly depleted in the lower mantle. These elements just shouldn't be in the core. Recent geoneutrino detection experiments (KamLAND 2011) bolster these views, at least with regard to 238U and 232Th. (The neutrinos produced by 235U and 40K are of too low an energy to be detected by existing detectors.) That uranium and and thorium are not present in the Earth's core is consistent with results from the these geoneutrino observations. Nonetheless, several recent papers (e.g., Lay 2008) argue for a very high CMB heat flux. This presents several problems. One is that it means the Earth's inner core is very young, a billion years old or less (Labrosse 2001). Others argue that the inner core is at least two billion years old (Stacey 1999), and possibly even older. A related problem: If the Earth's inner core is very young, what powered the geodynamo prior to the formation of the inner core? Another problem is that this high heat flux means implies a non-negligible amount of radiogenic heating in the Earth's core. One way around this dilemma is that the Earth's core does contain a non-negligible amount of radioactive elements, particularly 40K (Nimmo 2004). Others argue that even if it is possible for potassium to enter the core, there just isn't enough potassium in the Earth to explain a large heat flux from the core (Lassiter 2006). An alternative is that a considerable amount of heat is generated at the CMB, in the D'' layer. The recent discovery of post-perovskite might provide a mechanism. There could well be a deep magma ocean or a partial melt at the base of the mantle (Labrosse 2007, Stixrude 2009). As uranium, thorium, and potassium are incompatible elements, this deep magma ocean would naturally contain concentrated amounts of those elements. KamLAND 2011. KamLAND Collaboration (2011), "Partial radiogenic heat model for Earth revealed by geoneutrino measurements," Nature Geoscience 4.9 : 647-651. Labrosse 2001. Stephane Labrosse, Jean-Paul Poirier, and Jean-Louis Le Mouël (2001), "The age of the inner core," Earth and Planetary Science Letters 190.3 : 111-123. Labrosse 2007. Stéphane Labrosse, J. W. Hernlund, and Nicolas Coltice (2007), "A crystallizing dense magma ocean at the base of the Earth’s mantle," Nature 450.7171 : 866-869. Lassiter 2006. J. C. Lassiter (2006), "Constraints on the coupled thermal evolution of the Earth's core and mantle, the age of the inner core, and the origin of the 186 Os/ 188 Os “core signal” in plume-derived lavas," Earth and Planetary Science Letters 250.1 : 306-317. Lay 2008. T. Lay, J. Hernlund, and B.A. 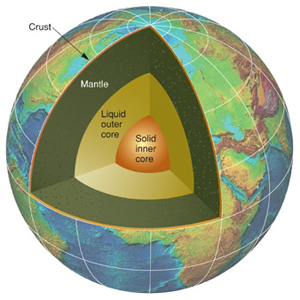 Buffett (2008), "Core–mantle boundary heat flow," Nature Geoscience 1.1 : 25-32. Nimmo 2004. F. Nimmo, et al. (2004), "The influence of potassium on core and geodynamo evolution," Geophysical Journal International 156.2 : 363-376. Stacey 1999. Frank D. Stacey and Conrad HB Stacey (1999), "Gravitational energy of core evolution: implications for thermal history and geodynamo power." Physics of the Earth and Planetary Interiors 110.1 : 83-93. Stixrude 2009. Lars Stixrude, et al. (2009), "Thermodynamics of silicate liquids in the deep Earth," Earth and Planetary Science Letters 278.3 : 226-232. Williams 2006. J. G. Williams, et al. (2006), "Lunar laser ranging science: gravitational physics and lunar interior and geodesy," Advances in Space Research 37.1 : 67-71. Yoder 2003. C. F. Yoder, et al. (2003), "Fluid core size of Mars from detection of the solar tide," Science 300.5617 : 299-303. Hot stuff on the surface of the Earth cools fast because air can carry away the heat pretty easily by convection. This heat is eventually radiated back to space. The outer core, on the other hand, touches the hot mantle. Due to the relatively small temperature difference, there's not much heat transfer to the mantle. The mantle itself does slowly cool, but this is at the subduction zones in the ocean (which are relatively few compared to the entire surface area of the mantle), as the rocky crust insulates the mantle. Besides that, radioactive decay is a significant contributor to keeping the outer core molten. So, no, the core won't cool significantly in the forseeable future. Earth is big, so takes a long time to cool down. Note that Mars, being smaller, has already cooled down to this point. The heat from radioisotope decay over something with the mass/area ratio of earth is significant. Not the answer you're looking for? Browse other questions tagged temperature earth geophysics or ask your own question. Why does solid turn to liquid deep in the Earth? How can it be that the sun emits more than a black body? Why isn't the Earth's core temperature the average of its surface temperatures? Will the earth never cool, but only get hotter? How much heating does Earth inner core provide to the surface? Why are we not affected by the radiation of the radioactive decay going inside the Earth? Does gravity acting on a resting object produce any heat? Why is the inside of the Earth hot? Why are the cores of planets melted? How does the inner core relieve stress as the Earth's rotation slows? Why did the Earth cool down? Why does earth's magnetic field change its direction? If the gravity at the center of the Earth is zero, why are heavy elements like iron there? Is it possible to 'push' a path to the Earth's core? Why doesn't the heat of the Earth's core diffuse to the surface?